The vector stencils library Chile contains contours for ConceptDraw DIAGRAM diagramming and vector drawing software. This library is contained in the Continent Maps solution from Maps area of ConceptDraw Solution Park. 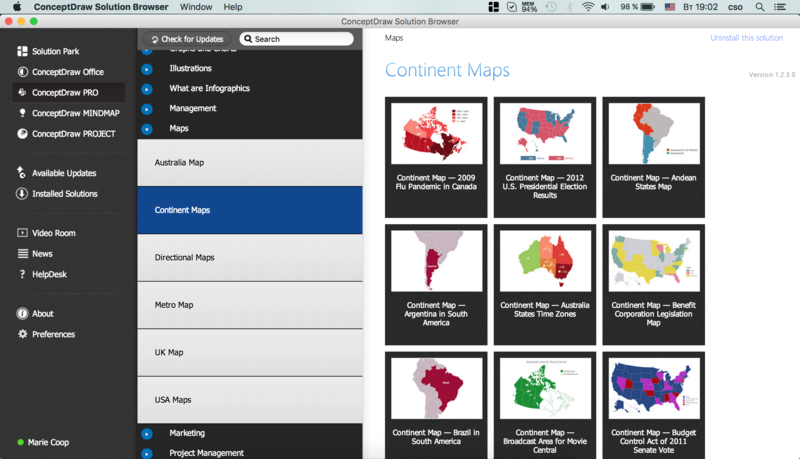 Use the Chile library to draw thematic maps, geospatial infographics and vector illustrations for your business documents, presentations and websites. 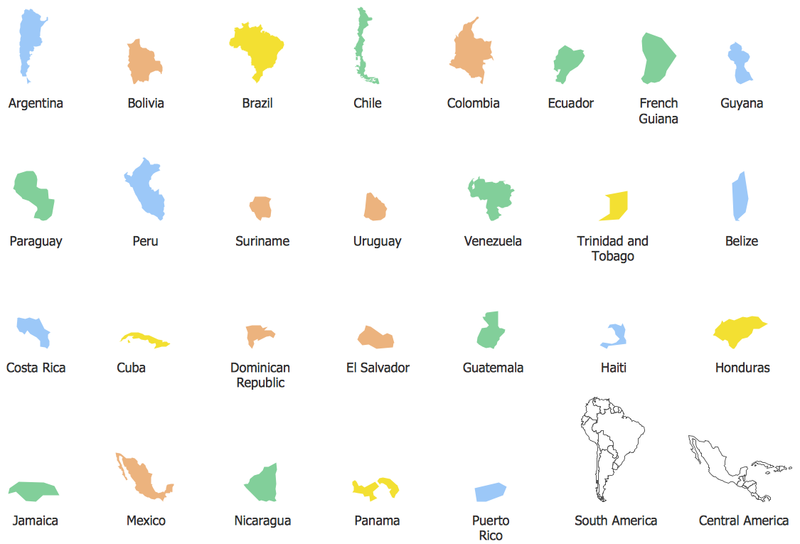 Chile is divided into 15 regions, each headed by an intendant appointed by the president. 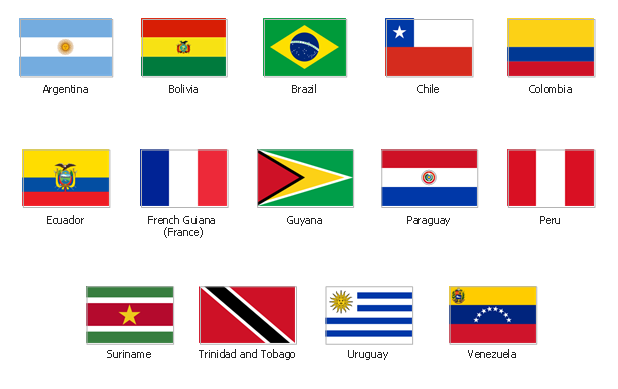 "Spanish and Portuguese are the most spoken languages in South America, with approximately 200 million speakers each. Spanish is the official language of most countries, along with other native languages in some countries. Portuguese is the official language of Brazil. Dutch is the official language of Suriname; English is the official language of Guyana, although there are at least twelve other languages spoken in the country, including Portuguese, Chinese, Hindustani and several native languages. English is also spoken in the Falkland Islands. 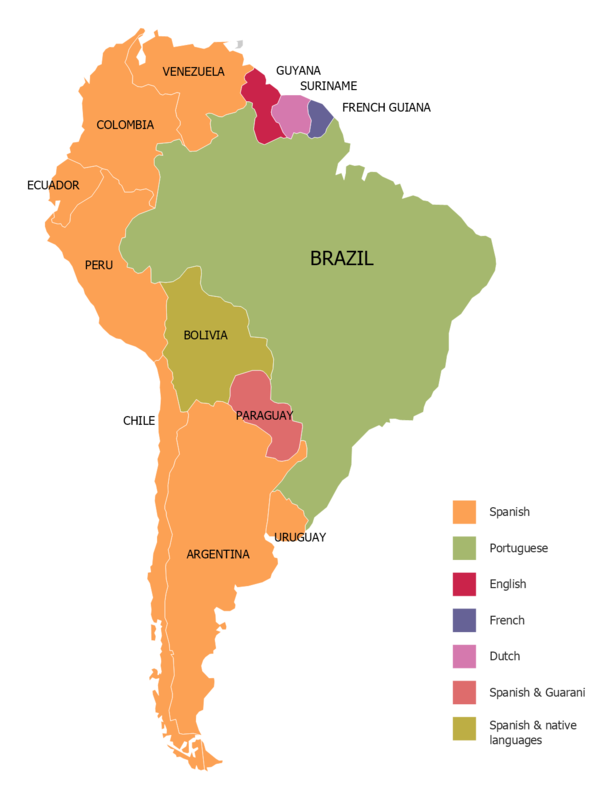 French is the official language of French Guiana and the second language in Amapá, Brazil. 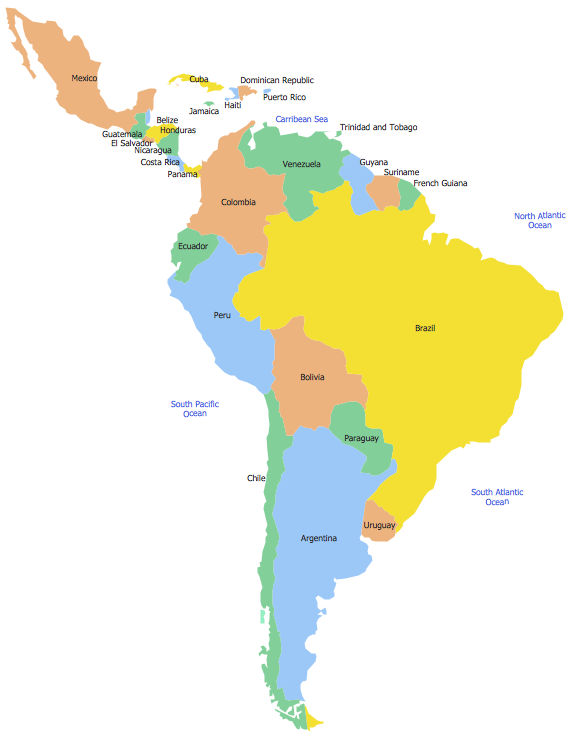 Indigenous languages of South America include Quechua in Ecuador, Peru, Chile, Colombia, and Bolivia; Wayuunaiki in northern Colombia (La Guajira) and northwestern Venezuela (Zulia); Guaraní in Paraguay and, to a much lesser extent, in Bolivia; Aymara in Bolivia, Peru, and less often in Chile; and Mapudungun is spoken in certain pockets of southern Chile and, more rarely, Argentina. At least three South American indigenous languages (Quechua, Aymara, and Guarani) are recognized along with Spanish as national languages." Nicaragua, officially the Republic of Nicaragua, is the largest country in the Central American isthmus, bordering Honduras to the north and Costa Rica to the south. The vector stencils library Nicaragua contains contours for ConceptDraw DIAGRAM v12 diagramming and vector drawing software. This library is contained in the Continent Maps solution from Maps area of ConceptDraw Solution Park. Paraguay, officially the Republic of Paraguay, is a landlocked country in South America, bordered by Argentina to the south and southwest, Brazil to the east and northeast, and Bolivia to the northwest. The vector stencils library Paraguay contains contours for ConceptDraw DIAGRAM v12 diagramming and vector drawing software. This library is contained in the Continent Maps solution from Maps area of ConceptDraw Solution Park. 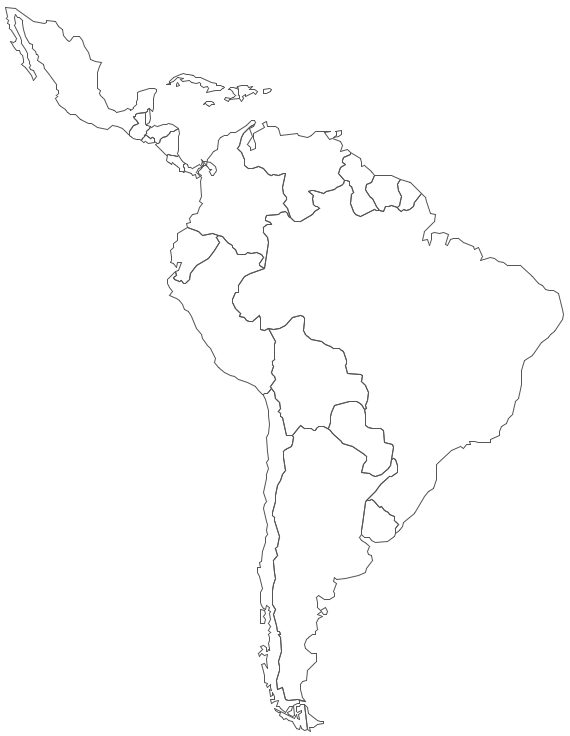 Argentina, officially the Argentine Republic, is a federal republic located in southeastern South America. The vector stencils library Argentina contains contours for ConceptDraw DIAGRAM v12 diagramming and vector drawing software. This library is contained in the Continent Maps solution from Maps area of ConceptDraw Solution Park. Montana is a state in the Western United States. The vector stencils library Montana contains contours for ConceptDraw DIAGRAM v12 diagramming and vector drawing software. This library is contained in the Continent Maps solution from Maps area of ConceptDraw Solution Park.